Under relentless Wall Street scrutiny, Facebook has clammed up about its advertising experiments. But one ad broker invited into the social network’s nascent ad exchange says the marketplace is light-years ahead of competing offerings from Google, Yahoo, Rubicon and others – and that advertisers are clamoring to pump more money into it. Facebook Exchange is “exponentially better” than competing systems, says Zach Coelius, whose company Triggit places advertiser bids on Facebook Exchange and all its major competitors. Coelius says his company’s limited data from three months of trials suggests Facebook customers targeted through the exchange are roughly twice as likely to buy or otherwise “convert” after clicking on an ad as those targeted through competitors. To sweeten the deal, such ad orders cost approximately one-sixth as much when acquired via Facebook Exchange versus competitors. Triggit’s data provides the most extensive information yet on an experimental product that could turn into a strategic crown jewel for Facebook. Launched in late June with just eight participants, Facebook Exchange offers advertisers the chance to follow customers from certain websites onto Facebook and then bid to show them an ad. That practice is known in the online ad industry as “real-time bidding” and is widely adopted, including by Google via the DoubleClick Ad Exchange and by Yahoo via Right Media. It is often used to target people who visit an e-commerce website and browse for a particular type of product, urging them to come back and complete a purchase. Coelius attributes Facebook’s performance to a “highly engaged audience” and to the fact that people tend to log on to the social network at both home and work, making them much easier to track. 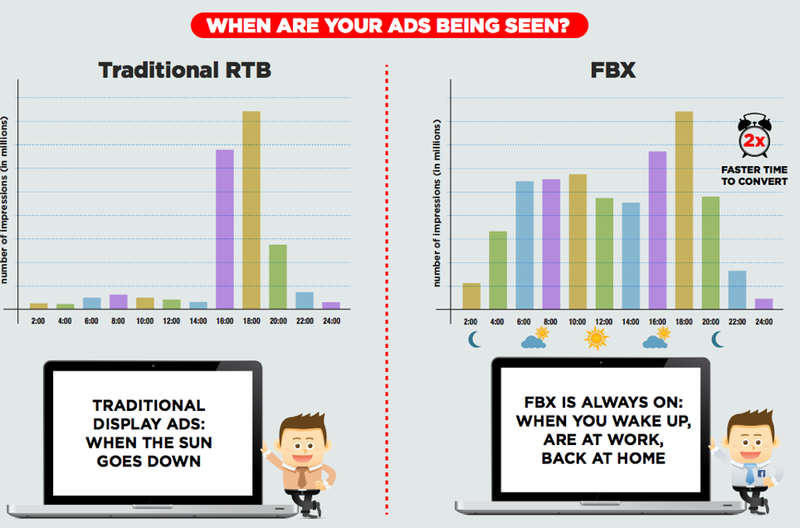 A chart prepared by Triggit (below) shows traditional ad exchanges like Google’s DoubleClick Ad Exchange (grouped together on the left) tend to to be dormant during the workday and to sell most of their ad impressions at night, when people get home from work. Facebook Exchange, in comparison (on the right), sells more than half as many ads at 10am as it does at 6 p.m. Being able to target consumers around the clock is crucial to the merchants, app sellers and other transaction-driven advertisers who tend to use ad exchanges. “In our business, an expression of intent – a desire to find a pair of shoes, for example — goes stale very quickly,” Coelius says. 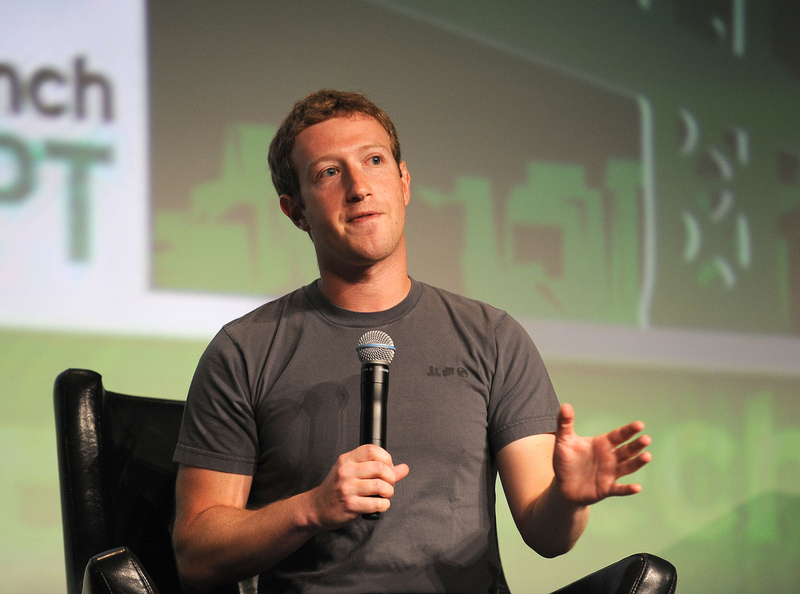 Many of Triggit’s advertisers would like Facebook to lift the exchange’s experimental status so they can spend more money on it, but the social network’s reticence to do that is understandable. Because they are based on your past web behavior, including searches and site visits, exchange ads can seem creepy to users, and Facebook has already ignited more than its share of privacy controversies and must tread carefully with its massive user base. Unlike some of the initiatives of Facebook’s past, Facebook Exchange does not take the company into virgin territory; its competitors are already there. And it might make Facebook ads less annoying. “The relevance of the ads outweighs any concerns [users] might have,” Coelius says. Given the state of Facebook’s stock – and Facebook Exchange’s potential to lift it – the social network no doubt hopes that’s true.